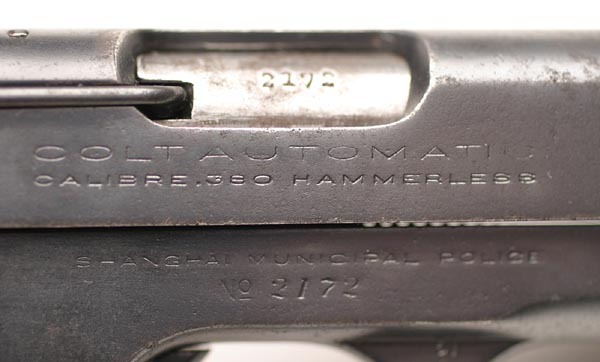 The earliest pistols acquired for the Shanghai Municipal Police were at least 270 in quantity (based on SMP records) with no indication of caliber. It is presumed that these were obtained from commercial distributors since there are no Colt records of these shipments documenting a contract order prior to the Colt documented contract shipments from 1925 to 1938. 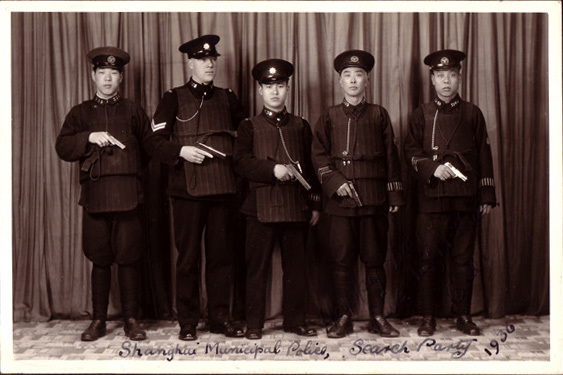 A 1930 Photo of the Shanghai Municipal Police with their guns drawn in a "Search Party." Note, the English Cpl. has a Colt 1911 and so does the Chinese Officer next to him while the other three have their Colt 1908. It seem to be a posed picture. It may be hard to see but they all have on, what looks like, a Bullet Proof Vest of that period. You can see a lanyard on 4 of them BUT not the HOLSTER as it would be under the vest. a key shaped leaf spring on the left side of the slide used to put pressure on the barrel during recoil - this was to prevent jamming. 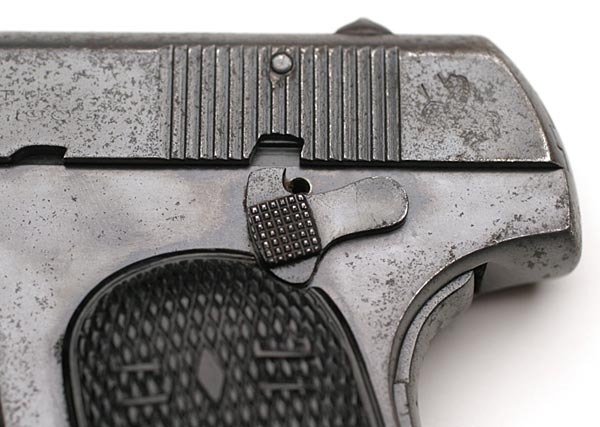 This feature was installed on most pistols at the SMP armory rather than at the Colt factory. If done at the Colt factory, this part does not encroach upon the left side factory roll marks. 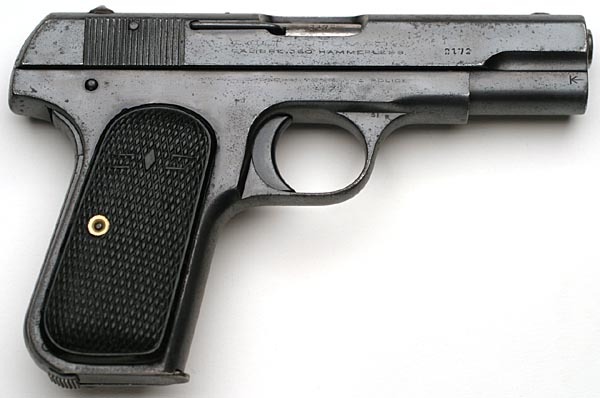 This pistol, serial number 105911, is one of 600 pistols shipped June 20, 1929, making it part of the thirteenth documented shipment of SMP marked pistols. The total number of Colt documented SMP shipped guns number 4,185. 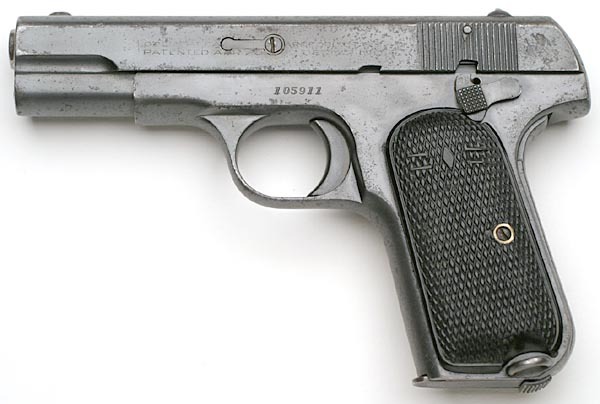 Virtually all of the SMP marked Colt Model M .380 pistols have been reblued at some point in time. The harsh climate was very unforgiving to the finish of these pistols. These guns were shipped with medallion checkered walnut grips and the walnut held the moisture against the frame of the pistol causing extreme pitting under the grips. The magazine safety disconnectors were typically removed from these guns, allowing them to be operational when changing the magazine. This example has had the magazine safety disconnector removed. These pistols were fitted with factory lanyard loops on the left side of the frame. Some SMP contract magazines had the viewing holes in the front and back, as opposed to the sides as on standard commercial magazines. Others have side viewing holes as well as viewing holes in the back. There are varying opinions as to why the location of the viewing holes was changed. One story is that the Shanghai Municipal Police would trade the bullets from their guns and replace the live round with a spent brass casing. 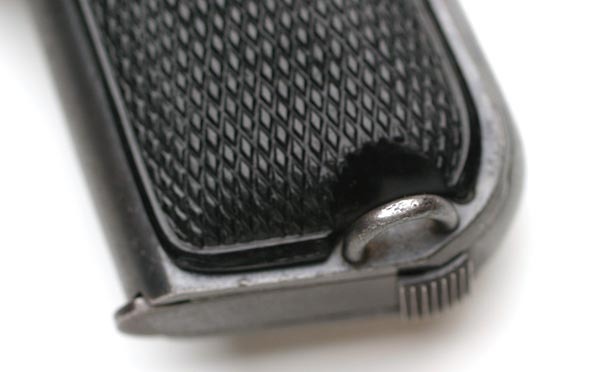 In a Colt magazine with standard viewing holes, the magazine would appear loaded.